AMD GPU MeshMapper has reached end of life. AMD no longer supports GPU MeshMapper, but makes it available for download without warranty. Lighting objects using information stored in auxiliary maps such as normal or ambient occlusion maps has become a de-facto standard for achieving high quality visuals. GPU MeshMapper re-invents the process of generating maps (including normal, displacement, and ambient occlusion maps) for a low-resolution mesh based on the details from a high-resolution mesh. 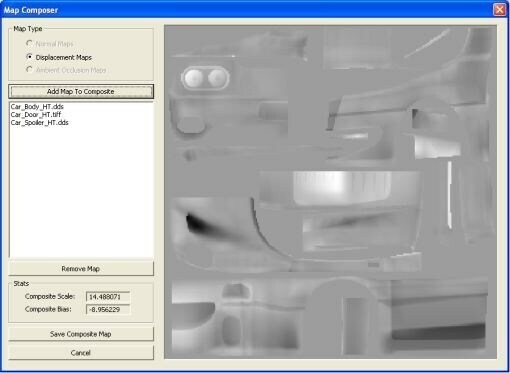 The tool includes an intuitive user interface for controlling all aspects of map generation. The tool was designed with input from artists in order to tailor the interface to the digital asset creation process. A wide range of settings allows you to fine tune the map generation for your specific models. For complex models, generate maps for individual components and then use the MapComposer to recombine the maps so that the final result will have a proper scale and bias which takes full advantage of the available dynamic range. Artists can quickly visualize how their objects will look with generated maps using the preview feature. If you’re using one of the AMD’s latest ATI Radeon graphics cards, the preview window allows you to render the low-resolution mesh with displacement and tessellation directly in the tool. Project and script files allow you to save your settings between uses and easily incorporate map generation into your current art pipeline. You can automate the generation process by using the batch scripting mode for quick integration into your game’s art pipeline. Improved ambient occlusion map generation. Updated to use the latest ATI Tessellation library. 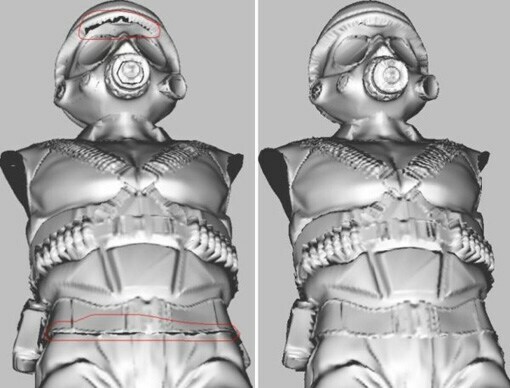 Rendering a Soldier model with displacement mapping enabled. Left: Using a displacement map generated with GPU MeshMapper v1.0. Right: Using a displacement map generated with GPU MeshMapper v1.1. Notice the geometry cracks along texture uv boundaries in the left figure (the area inside the red circles). Rendering a Soldier model with displacement mapping and hardware tessellation enabled. Left: Using a displacement map generated with GPU MeshMapper v1.0. Right: Using a displacement map generated with GPU MeshMapper v1.1. Notice the geometry cracks along texture uv boundaries in the left figure (the area inside the red circles). Improved seams for tangent space normal map. Rendering a Froblin model with tangent space normal mapping enabled. Left: Using a tangent space normal map generated with GPU MeshMapper v1.0. Right: Using a tangent space normal map generated with GPU MeshMapper v1.1. 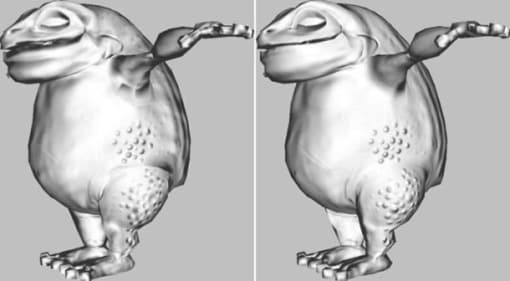 Notice the visible lighting seams under the Froblin arm and on the upper part of the Froblin leg in the left figure. Added an ability to save preview display options and camera settings for the low and high-res mesh into a project file. Added support for keyboard shortcuts. Added a composite display for the preview window’s title. Added a pan camera mode for the middle mouse button. Added support to capture a screenshot. Updated stats display to show the number of triangles for the low, high-res mesh and low-res mdesh after tessellation. Added an ability to perform dilation post-processing in the Map Composer. Fixed bugs and memory leaks. Improved support for generating 1K by 1K and 2K by 2K maps. For the complete list of features and bug fixes, please read the user documentation. NOTE: Tessellation will first be supported in the March Catalyst driver release. 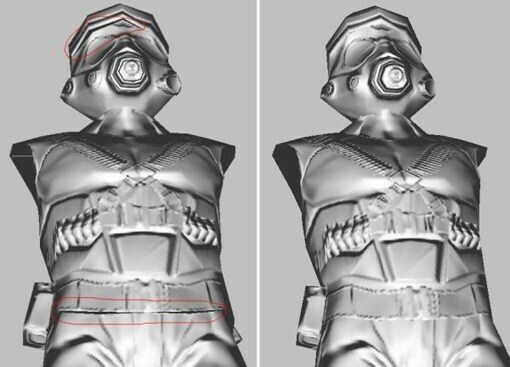 Preview the high-res model (right) side-by-side with the low-res model (left). Models can be rendered as points, wireframe, and solid. Models can be colored according to the texture coordinates, tangent, binormal, vertex normals, base map, normal map, displacement map, ambient occlusion map, and with phong lighting. 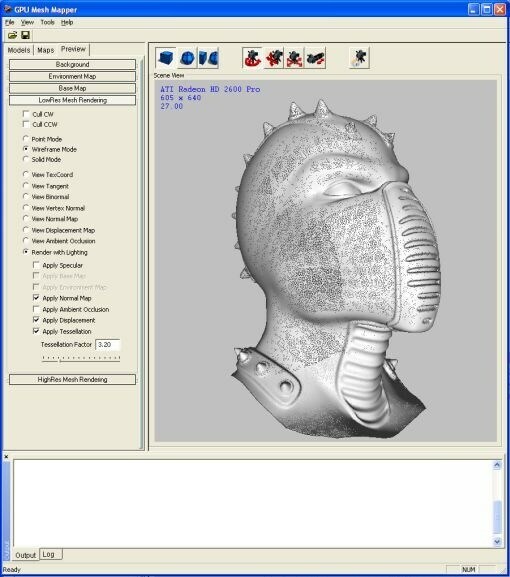 The low-res model rendered in wireframe with lighting according to the normal map, with displacement and tessellation enabled. Displacement and tessellation previewing is available with an HD2000 series or later card. Use the MapComposer to easily combine multiple maps that will be applied to a single model. Displacement maps will be dynamically adjusted to ensure that the final map takes full advantage of the available dynamic range. Generate a low-resolution mesh based on the details from a high-resolution mesh.